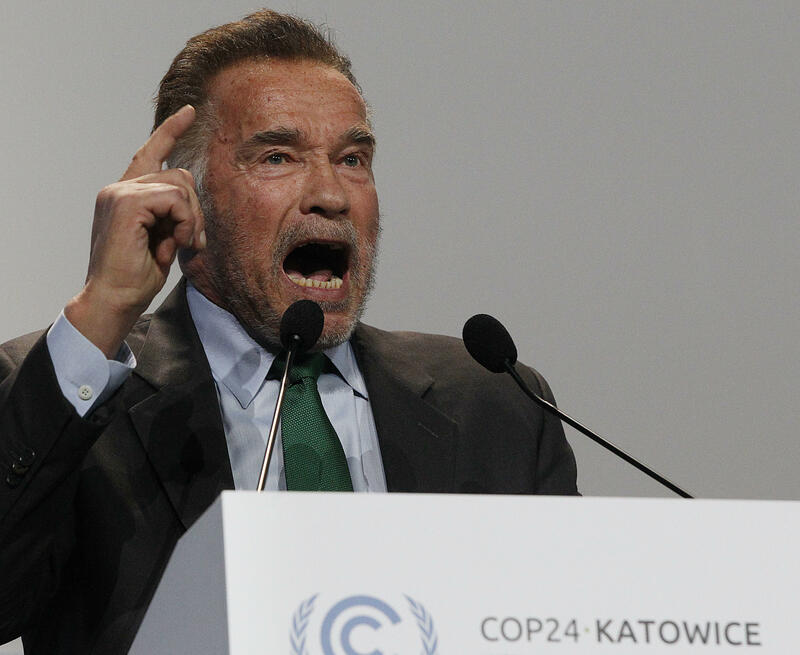 KATOWICE, Poland — Arnold Schwarzenegger said the United States is "still in" an international accord to curb global warming despite U.S. President Donald Trump's decision to walk away from the agreement. The actor and former California governor told delegates gathered for United Nations climate talks in Poland on Monday that "America is more than just Washington or one leader." Calling Trump "meshugge" - Yiddish for "crazy" - for deciding to withdraw from the landmark climate accord, Schwarzenegger insisted the 2015 agreement has widespread support at the local and state levels in the U.S. He said local leaders should be invited to next year's annual conference and emphasized the point in trademark fashion by saying: "And if you do that, I promise you: I'll be back." U.N. Secretary-General Antonio Guterres is appealing to world leaders to take seriously the threat of global warming and take bold action to avert a catastrophic rise in temperatures, calling climate change "the single most important issue we face." The U.N. chief chided countries, particularly those most responsible for greenhouse gas emissions, for failing to do enough to meet the goals of the Paris climate accord. A recently released National Climate Assessment warns the world is heading toward chaos by the end of the 21st century. The report was produced by 13 federal agencies, and suggested that no facet of life will be safe from the rising threat of climate change. One of the findings is that extreme temperatures, and more frequent droughts have already been connected to shortages in crops. It also found infrastructure in parts of the U.S. is nearing the end of its life expectancy. Even new facilities are not built to withstand climate changes. But Poland's President Andrzej Duda says the coal-reliant nation has no plans to totally remove this fossil fuel, which it has in abundance, from its energy mix. Duda said there's "no plan today to fully give up on coal" as Poland's supplies can run for another 200 years. The country still relies on coal for 80 percent of its energy. Duda said Poland has cut its carbon gas emission by 30 percent in the past three decades, while maintaining substantial economic growth. He said coal was Poland's "strategic fossil fuel" guaranteeing its energy security and sovereignty and "it would be hard not to use it." Famed naturalist Sir David Attenborough issued a stark warning, saying human civilization may collapse unless the world takes action. The British TV presenter of nature documentaries told leaders at the summit that "right now, we are facing a man-made disaster of global scale, our greatest threat in thousands of years." Attenborough urged the delegates to make progress on efforts to implement the 2015 Paris accord fighting climate change. The 92-year-old added that "if we don't take action, the collapse of our civilizations and the extinction of much of the natural world is on the horizon."